Geranium Care Tips from Leonberg Nursery | Maple Leaf Lawncare Inc.
Versatile, colorful, stately geraniums add a bold accent to any garden setting. These popular flowering plants have handsome, sturdy foliage and produce flowers that last throughout the gardening season. Look for them in a range of leaf shapes and flower colors including red, white, pink, salmon and coral. Geraniums beautify porches, balconies and flower beds. Compatible with many other plants, they can be mixed with shrubs, perennials and annuals for quick color or grouped with other plants in container gardens. Geraniums beautify porches, balconies and flower beds. (Pelargonium hor-torum) The two basic types of bedding plant geraniums are defined by their method of propogation. Cutting Geraniums (vegetatively propogated) are noted for large size, rich foliage, great early-season display adn flower beads with semi-double florets. They are ideal for specimen plantings. Cutting Geraniums are commonly called “Zonals” which refers to the zoned makings in their leaves–even though some cutting geraniums do not have zoned leaves. Seed Geraniums (seed propogated) have colorful flowers all season, are heat-tolerant and thrive in late summer and early fall when many other garden plants have begun to decline. They are used primarily in group plantings, Seed geraniums are commonly called, “Hybrids” which refers to being the offspring of genetically dissimilar parent plants– even though hybrid plants can be propogated by cuttings as well as by seed. (Pelargonium pelte-ium) Named for its ivy-shaped leaves and trailing growth habit, the Ivy Geranium has openly spaced florets on graceful spikes in a full range of colors. It’s attractive in hanging baskets, window boxes or as a flowering ground cover. Though it generally prefers a shadier, cooler location than do Bedding Geraniums, some of the new hybrids do well in warmer growing conditions. (Pelargonium grafrans, grareolens, tomentogum and others). These species are grown primarily for their fragrant leaves. Lemon, peppermint, nutmeg and apple are a few of the scents available. They may be grown in the garden or in hanging baskets. Many varieties can be used as flavorings in cooking or for making fragrant, dried potpourri for sachets or decorative decanters. (Pelargonium domesticum) This outstanding geranium is popular for its large, colorful, single or double-petaled flowers which are often bi-colored with decorative stripes. It makes a lovely house plant. BEFORE YOU BUY – Start with healthy geraniums, well developed, dark green and vigorous. For best results, choose a planting location with at least 506 hours of full sun each day. 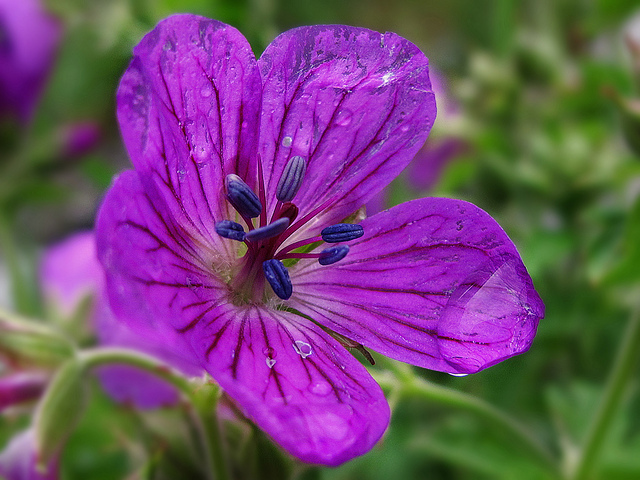 PRE-PLANTING CARE – If you can’t plant the day of purchase, water thoroughly and place geraniums in the shade. Evenings or cloudy days are the best times to plant. SOIL PREPARATION – Flower Beds- Spade deeply. Loosen heavy clay or clay-bard soil by adding compost, peat moss, sand or ground bark. Mix in 2 lbs. 5-10-5 fertilizer per 100 sq. ft. or 1 lb. 10=10=10 fertilizer per 100 sq. ft. Turn soil over; rake smoother. Container Gardens- Fill with moistened commercial potting soil. Do not use straight field or garden soil since it may have inadequate drainings and carry insects and disease as well as wood seeds. AFTER-PLANTING CARE – Water thoroughly immediately after planting and thereafter whenever the soil begins to dry. Water early in the day, soaking at ground level. (Sprinkling the foliage or relying on rainfall isn’t enough.) Cut off faded blooms and pinch long stem occasionally to keep a compact, bushy shape. Fertilize soil at regular intervals according to label directions with a water-soluble fertilizer containing nitrogen, phosphorus and potassium.